Buy these individually wrapped pretzel rods to give to friends and family for the holidays, to give as holiday party favors, or to serve as festive treats to visitors during the holiday season. No matter how you choose to use them, they'll love receiving one of these delicious sweet and salty snacks. 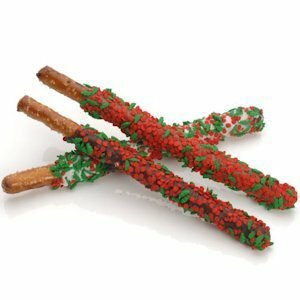 Standard 8" long pretzel rods are dipped in either milk, white or dark chocolate (you'll receive an assortment) and then decorated with green holly and red berry sprinkles. You must buy at least 12 pretzel rod favors. Price shown is per pretzel rod.